Desensitised came forth out of the band Catafalque with members Susan, Steven and Rutger. They released their first MCD "Thriving On Carnage" in July 2002. They got back into the studio in June 2003 to record for their new MCD "Bought Beaty" wich was released in June 2004. The band then took a major change in the Line-up, with only Susan remaining as an original member. In February 2005 they recorded their first full-length album "Virus of Violence", wich was supposed to be released later that year, but do to lack of a record label wasnt released. 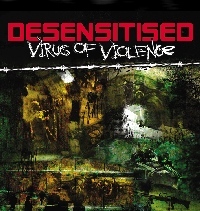 now in 2006 they found a label and are going to release "Virus of Violence".